Earlier this year, UCL opened its new Octagon Gallery, a new exhibition space for displaying research being carried out at the College. 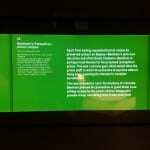 Each exhibition lasts six months, and the newest is on the theme of ‘Digital Transformations’, curated by Claire Ross, Research Assistant at UCL’s Department of Information Studies and Centre for Digital Humanities (amongst other things, Claire is the lead researcher on the award-winning QRator project). 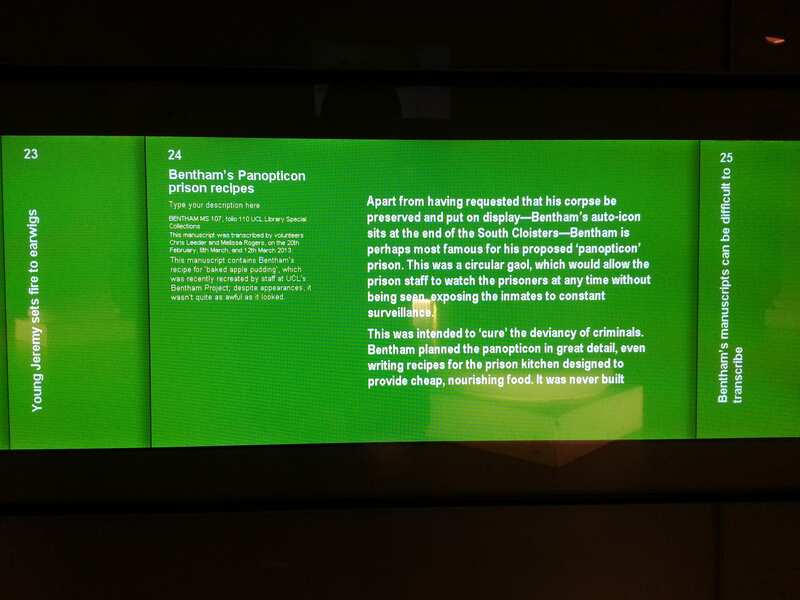 Claire has very kindly included Transcribe Bentham in her exhibition. 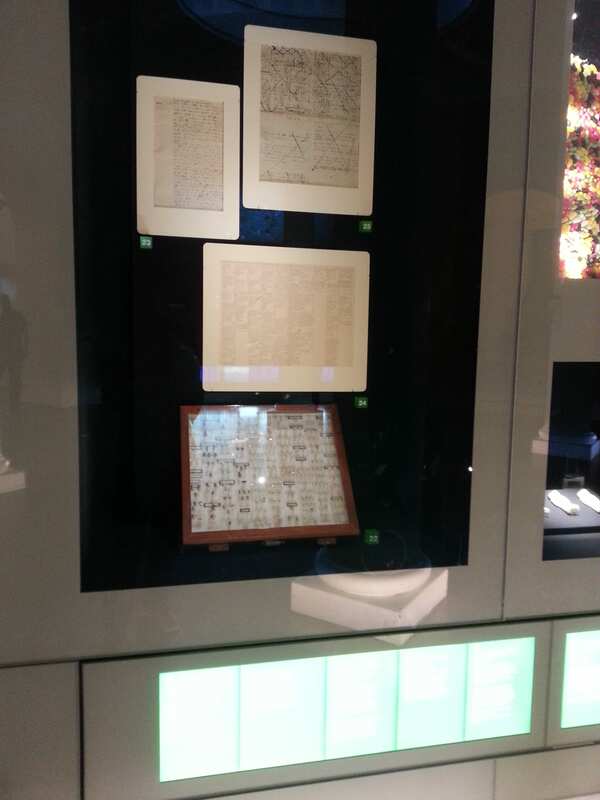 Four Bentham manuscripts have been installed in the exhibition: JB/027/026/004 (transcribed by Diane Folan), in which Bentham recalls setting fire to ear-wigs as a child; JB/107/110/001 and JB/107/110/002 (transcribed by Joy Lloyd, Chris Leeder, and Melissa Rogers), in which Bentham sets out a series of recipes for his panopticon prison; and JB/079/047/001 as an (admittedly extreme) example of the challenges faced by Transcribe Bentham volunteers in attempting to decipher Bentham’s manuscripts. 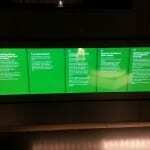 Below the manuscripts is an interactive ‘data rail’, which shows the transcripts and some contextual information. 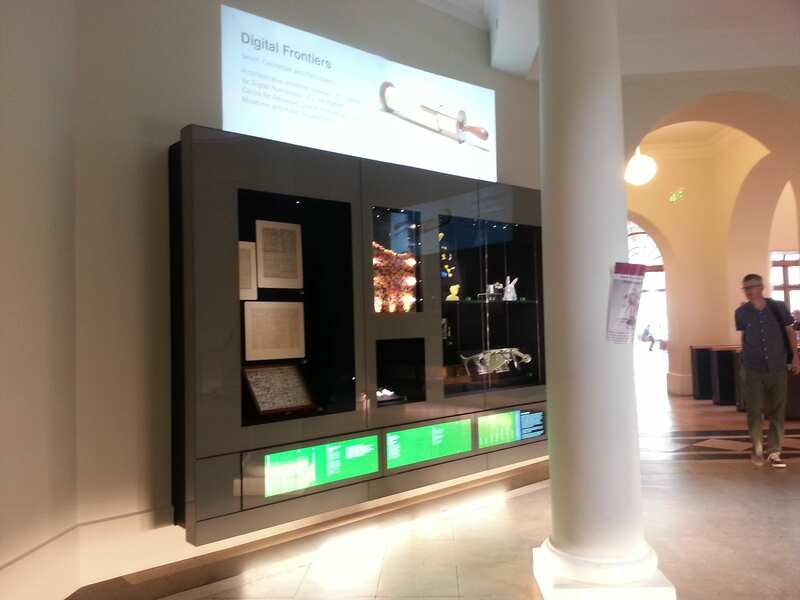 Needless to say, we are delighted that the work of Transcribe Bentham‘s volunteers is being showcased in such a prominent spot, and will show off both their considerable efforts and the sort of discoveries which are being made through their transcripts. 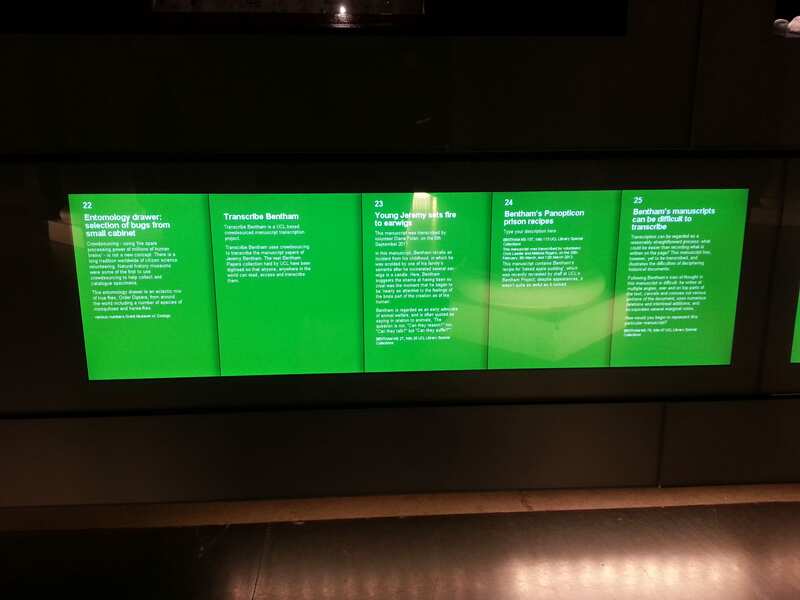 We hope that those in the London area might be able to visit, and for those further away, below are a few pictures of the TB part of the exhibit. (Thanks again to Claire for having TB included in the exhibition, and to UCL Special Collections for their work in preparing and installing the manuscripts). On 7 September 2010, Transcribe Bentham was officially launched upon an unsuspecting public, with the aim of recruiting volunteers from around the world, whatever their background, to help transcribe the unpublished manuscripts of Jeremy Bentham. Our initial progress was steady, if not necessarily spectacular: by the end of our testing period on 8 March 2011 (funded by the Arts and Humanities Research Council), 1,009 manuscripts had been transcribed or partially transcribed, of which 569 (56%) were complete. The end of April 2011 also saw the cessation of our twelve-month AHRC grant, and the project’s future did not look particularly promising. A recent Chronicle of Higher Education article (citing a paper by TB staff published in Literary and Linguistic Computing earlier this year), notes our finding that had the two full-time members of staff employed for Transcribe Bentham instead been devoted to transcription alone for twelve months, then they could have produced around two and-a-half times as many transcripts as volunteers would have done in the same period. This finding is certainly true of the state of play at the end of the testing period, but due to the vagaries of academic publishing schedules, it by no means represents what TB and its volunteers have done since, nor the current state of progress. 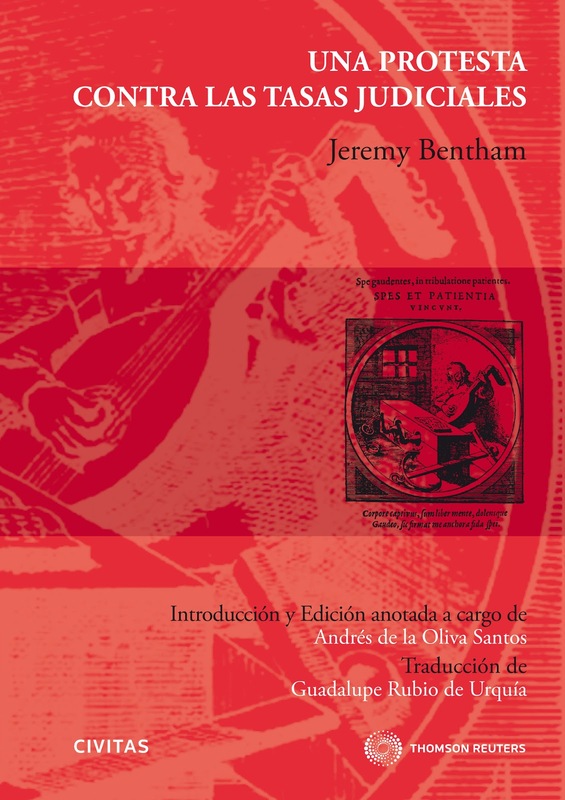 After the testing period ended, Transcribe Bentham won a major international award, its ‘Transcription Desk’ software (developed by the University of London Computer Centre) was released on an open source basis for others to reuse and customise, and (we hope) the project has helped to promote scholarly crowdsourcing and Bentham studies over the past two years. Most impressive of all, however, has been the sheer volume of work carried out by (an admittedly small core of) TB volunteers, despite the project being run on minimal funding for the past eighteen months, and having rather less staff time devoted to it than is ideal. 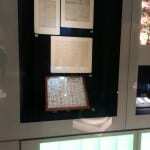 As 7 September 2012, 4,255 manuscripts have been transcribed or partially transcribed. 4,033 (94%) of these transcripts are now complete. This means that they are of the required standard for uploading to UCL’s digital repository, and for use, ultimately, in the production of future volumes of The Collected Works of Jeremy Bentham. This means that volunteer transcribers have achieved yet another landmark, having completed over 4,000 transcripts (or over 2.1 million words, plus extensive XML markup). There are often worries about the quality of the products of crowdsourced tasks, but we are delighted to report that despite having to deal with Bentham’s handwriting, syntax, style, and occasional habit of almost obliterating a page with deletions, marginalia and interlineal additions, the work of transcribers is of an extremely high standard. The amount of effort, care and attention that TB volunteers put in to ensure that their work is accurate is second to none. They are also transcribing at a faster rate than one full-time member of staff could manage if she or he were devoted solely to transcribing; an unlikely scenario, given our multifarious duties! We are very lucky that they have chosen to participate, and that they continue to do so. So, where next for the intiative? Transcribe Bentham will at the heart of the Consolidated Bentham Papers Repository, a project funded by the Andrew W. Mellon Foundation which begins officially on 1 October, and is funded for two years. This will see much of the UCL Bentham Papers digitised and made available for transcription and research, as well as all of the Bentham material held by our new partner institution, the British Library. Significant improvements will be made to the transcription interface to make the process more straightforward for volunteers, and we will be consulting with transcribers as to what kind of improvements they would find useful (this software will, again, be released on an open source basis for other projects to utilise). We hope this new interface will prove to be more attractive to current and potential volunteers, and further increase the rate of transcription. We have also received some further exciting news, and look forward to talking about that in the coming months. As ever, we end by thanking our volunteers as without them, there would be no Transcribe Bentham. We remain hugely grateful for their time and efforts, and think that the work they do should be celebrated. You can keep up to date with the progress of Transcribe Bentham at the project’s blog, and register to participate at the Transcription Desk. 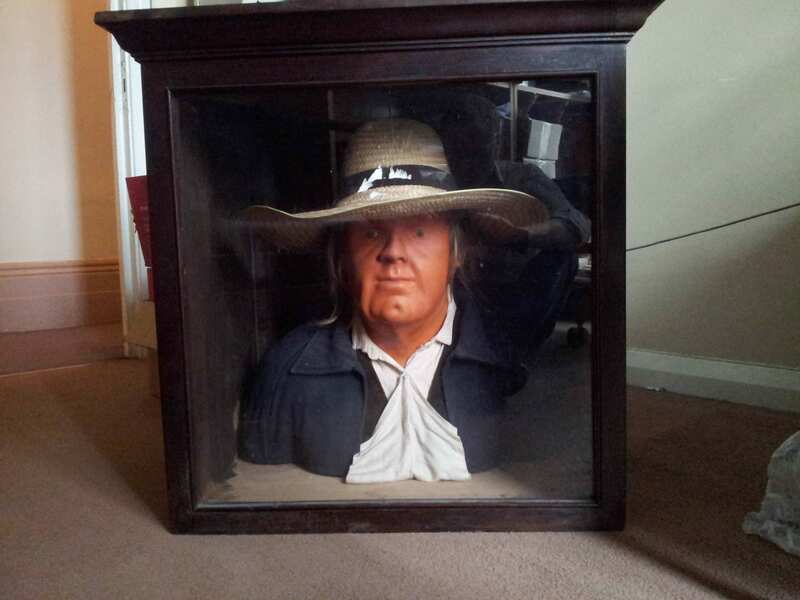 Of those who know something of Jeremy Bentham’s auto-icon—his preserved skeleton, dressed in his clothes, which sits in a box here at UCL—some will be aware that Bentham originally planned that his real (preserved) head would form part of the display. Unfortunately (or fortunately, depending on your point of view) the result of the preservation process was decidedly unpleasant; those with a strong enough constitution can have a look at the real thing in this Bentham Project video. Though the real head has been displayed at Bentham’s feet, and in a box of its own on top of the auto-icon’s cabinet, it is no longer on public display as it has been classed as human remains. The head is extremely fragile (don’t believe those myths about students kicking it around like a football), and is now stored in environmentally-controlled conditions at UCL’s Institute of Archaeology. Access to it is very rarely granted, as even the slightest motion can cause hairs to fall off. Despite Bentham’s intentions, the preserved original head has never been part of the auto-icon. Since the process went so awry, a second head was created and it is this one with which most will be familiar. 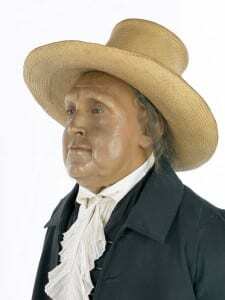 It wears Bentham’s hat, and some of his real hair was threaded into the wax. This second head is apparently an extremely good likeness—Bentham’s friend (Lord) Henry Brougham suggested that it was ‘so perfect that it seems as if alive’—and is certainly far less disturbing than the first. Much less well-known is Bentham’s third head, which is far less official a version than the other two, a crude plastic head and upper torso dating from the 1980s. One suspects that Brougham would not have been as taken with this likeness, which is disturbingly orange and much more country squire than utilitarian philosopher. Housed in a wooden box of its own, it was on display at the Jeremy Bentham pub—located just a quick walk from the auto-icon, on University Street—until a few years ago, when the pub underwent renovation works. The head was to be disposed of until rescued by the Bentham Project, and was stored in Room 112 at 26 Gordon Square (formerly my office) until summer 2012. We moved offices in August 2012, and there was no room for the third head in my new room. Fortunately, UCL’s Student Union is providing it with sanctuary, and it should ultimately be displayed there. We are very glad that it is going to a good home, and look forward to seeing it on public access again. I must admit that I won’t miss its orange visage staring out at me from its box while I’m trying to work, as though the big man himself was keeping an eye on me. 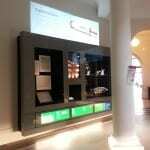 Update, 21 May 2013: If you want to see Bentham’s third head, it is now on display in the Huntley Bar at UCLU. 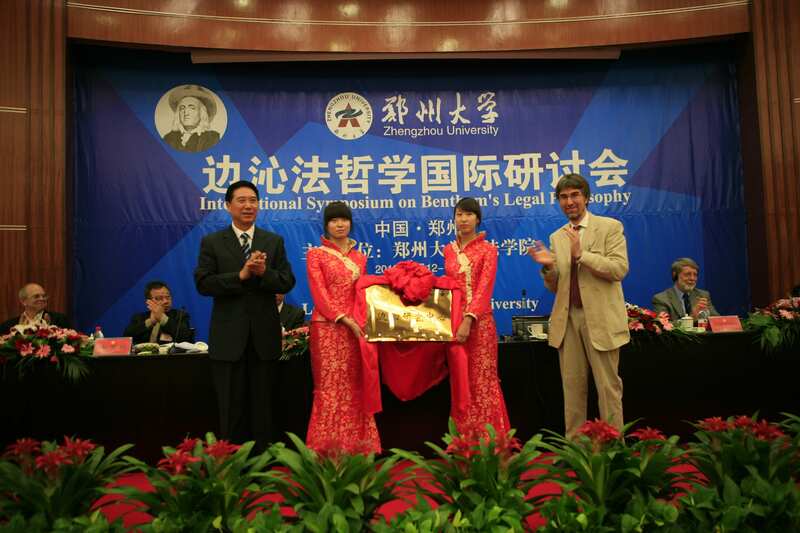 On 12 and 13 May 2012, what was almost certainly the first Chinese conference dedicated to the study of Jeremy Bentham was hosted by the Law School of Zhengzhou University. 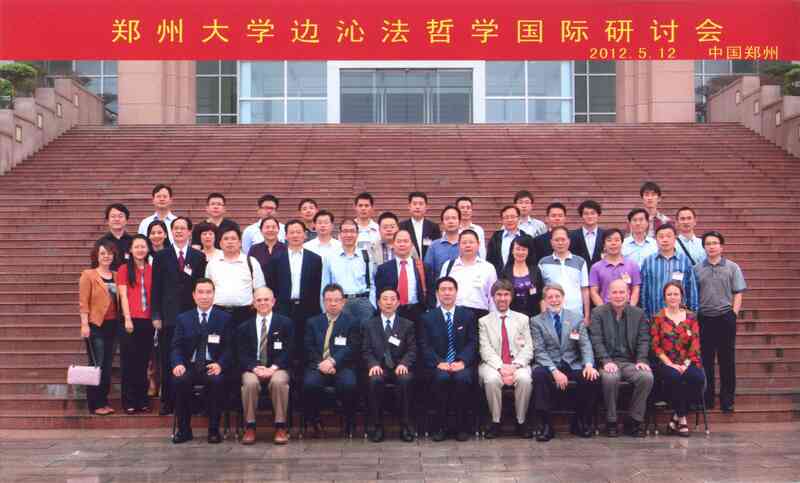 Professor Philip Schofield and Dr Michael Quinn from the Bentham Project were joined in attending by Professor David Lieberman from the University of California, Berkeley, Professor Gerald Postema from the University of North Carolina at Chapel Hill, and Dr Emmanuelle de Champs from the University of Paris VIII and the Centre Bentham. The conference proved to be a stimulating intellectual exchange, as both Chinese and Western scholars presented research on Bentham, before an audience of academics and students. Professor Schofield contributed both a lecture on Bentham’s critique of natural rights, in which he constructed a Benthamic response to contemporary critics of utilitarianism, such as John Rawls, and a paper based on his current editorial work on Bentham’s disinclination to regulate in matters of taste, particularly sexual taste. 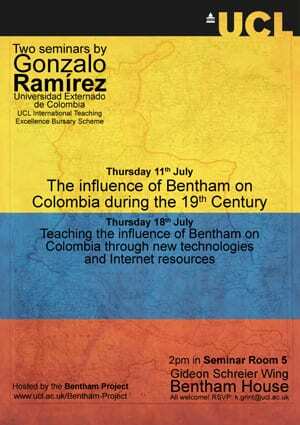 Professor Lieberman lectured on the idea of the mixed constitution, and read a fascinating paper on the connections between Bentham’s enthusiasm for codification and his democratic theory. 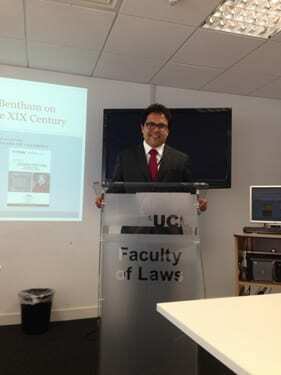 Dr de Champs revealed the extent to which the early Bentham self-identified as an active citizen in a European Republic of Letters, and Dr Quinn discussed some of the tensions involved in responding to the pains experienced by an illiberal majority in consequence of the proposed decriminalization of ‘harmless’ actions to which they objected. The Chinese audience responded enthusiastically to the lecture by Professor Postema on ‘The Ethos of Law’, which stressed the individual and collective responsibility for creating an environment in which power, public or private, was held consistently to account. 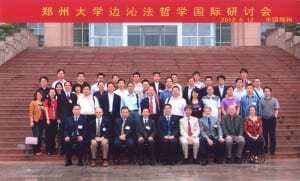 Dr Chen Jinghui presented a paper on Hart’s ‘Content-Independent Reasons’; Professor Guodong Xu explored the connections between Epicureanism and Utilitarianism; Dr Hongguo Chen investigated Bentham’s treatment of William Blackstone; Dr Danhong Wu painstakingly reviewed Bentham’s exhaustive discussion of the law of evidence; Professor Yanxin Su revealed the extent to which Bentham’s legal thought was influenced by his knowledge of Roman law; Professor Honghai Li sought to rehabilitate common law, in opposition to Bentham’s pejorative appellation ‘dog law’; and Professor Xiaobo Zhai presented a ground-breaking paper on Bentham’s ‘natural arrangement’. 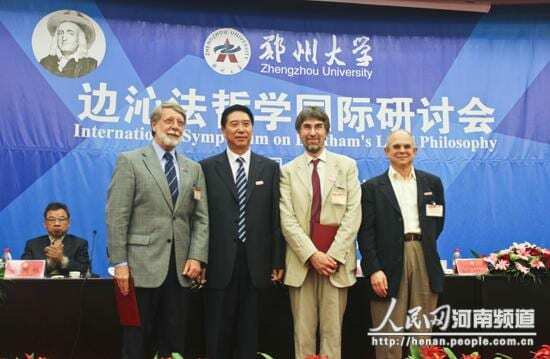 Professors Schofield, Lieberman and Postema were appointed honorary professors of Zhengzhou University, and Professor Schofield took part with the President of the University in inaugurating the new Bentham Centre at the University, under its Director Professor Xiaobo Zhai. 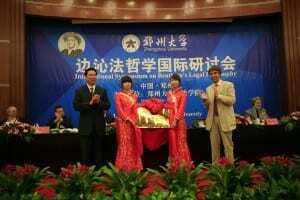 A fulsome tribute and accompanying thanks must be paid to the superb hospitality afforded by Zhengzhou University. All the foreign guests left harbouring wonderful memories of their time in China, and with the firm intention of broadening and deepening the new relationships forged during the trip. Their only regret concerned the recognition that they might never again be able to eat Chinese food in Europe or America: it’s just not the same as Chinese food in China! We feel sure that Jeremy would be happy to know of the developing interest in his thought in a country with one fifth of the world’s population, and would be anxious to promote the translation of his works into Chinese. An artwork by Shirin Homann-Saadat has been installed alongside the Auto-Icon here at UCL, and will be on display for the next month. 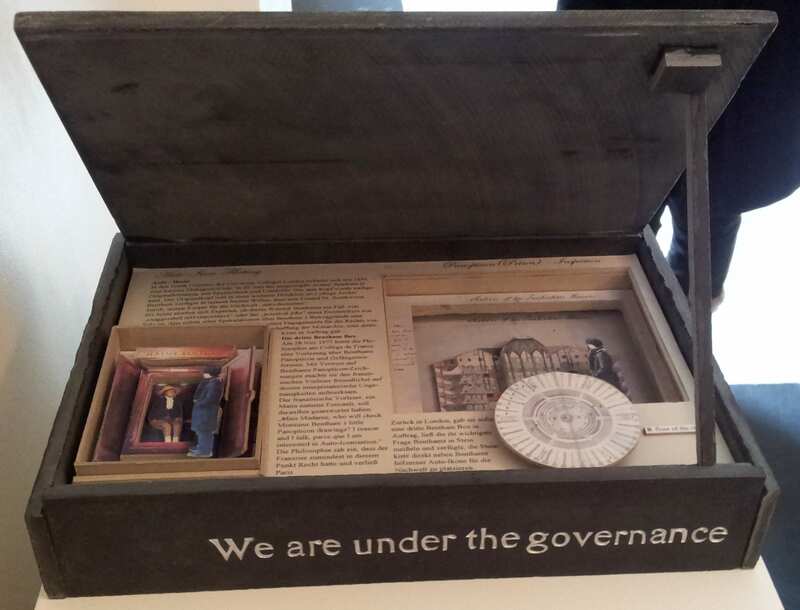 The piece is entitled ‘The Third Bentham Box‘ – after the first (containing the Auto-Icon), and the second (which contains Bentham’s head). 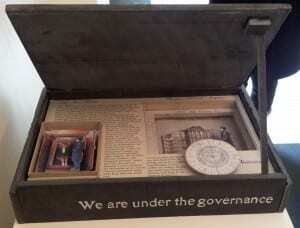 Since 1850 a strange mahogany box has been located in the South Cloisters of University College London. It contains the stuffed skeleton of Jeremy Bentham in his original clothes, with his cane and glasses. Only his head was “reconstructed”. His real head is to be found in a second box in the College archives. In his last will Bentham decreed that his friend Dr Southwood Smith should “auto-iconise” his body for posterity. Experts still debate whether Bentham’s wish to be “auto-iconised” was a case of exaggerated self-importance or the practical joke of an eccentric. 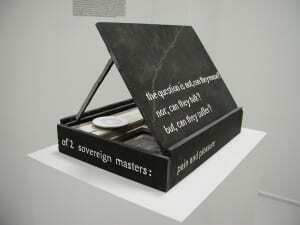 This work asks us many questions. 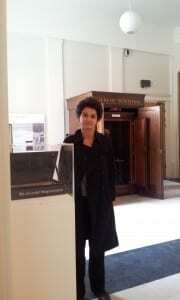 At UCL we simply stroll past the auto-icon, it’s part of the furniture which we stop seeing. Instead, we are now invited to reflect not only on just what Bentham is doing here, but on space, and how we live in it, on what makes us us, and not some body or some thing else, and on how the spaces we inhabit inform our self-perception. Bentham and Foucault disagreed about all these issues. What do you think? We are thoroughly delighted to be hosting this work, and look forward to reading your comments upon it – and Bentham’s Auto-Icon – in the space below.